We’ve seen many virtual reality headsets launched in the last year or so, even through the technology and ecosystem still needs to be improved to offer an acceptable user experience, but so far I have not seen augmented reality headset that combines 3D real and virtual worlds into a single screen. I was pretty enthusiastic about augmented reality technology when I first heard about in 2010, but fast forward to 2017, I’m not using any such apps myself, with the most popular AR app possibly being Pokemon Go game launched last year, and apps like the upcoming AR Measure look quite useful. Augmented reality normally works by holding your phone into your hands and the camera, but Mira Prism will change that it’s meant to be worn like a virtual reality headset and relies on a phone (iPhone only for now) to mix both worlds right in front of your eyes. But that’s all new and an interesting concept, so we’ll have to see how that evolves. The main advantage I see is that when you play in groups, you can still interact with other people. 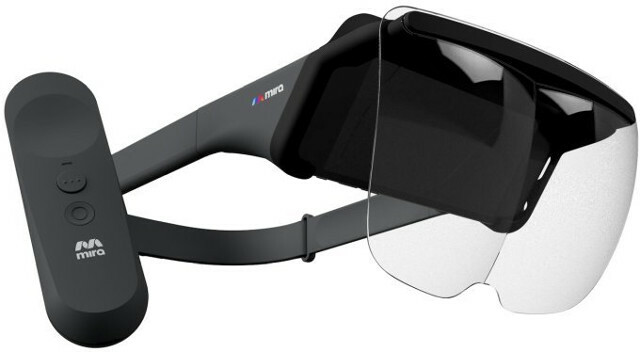 Mira Prism is also not too expensive with pre-orders going for $99 on Mira Reality website. Note that you’d need to wait until the end of the year to receive the headset, and price may go up to $149 after that. It’s also mostly targeted at developers right now, since few AR apps are available. It supports only iPhones now (6, 6S and 7). Not that attractive for people like me with Androids. Yes, but maybe this company or a competitor will come up with solutions for Android phones. I’m not sure if I am missing something, but $99 seems a lot to pay for what this is. It lets you strap an iPhone to head and see its reflection in the plastic goggles. The phone itself provides all the electronics: gyro, accelerometer, compass, camera. The external controller seems to be similar to a $7.00 “Bluetooth VR controller” I purchased at a local discount store. There is a little bit more than strapping a smartphone to one’s forehead. The lenses do most of the heavy lifting and they are not cheap.